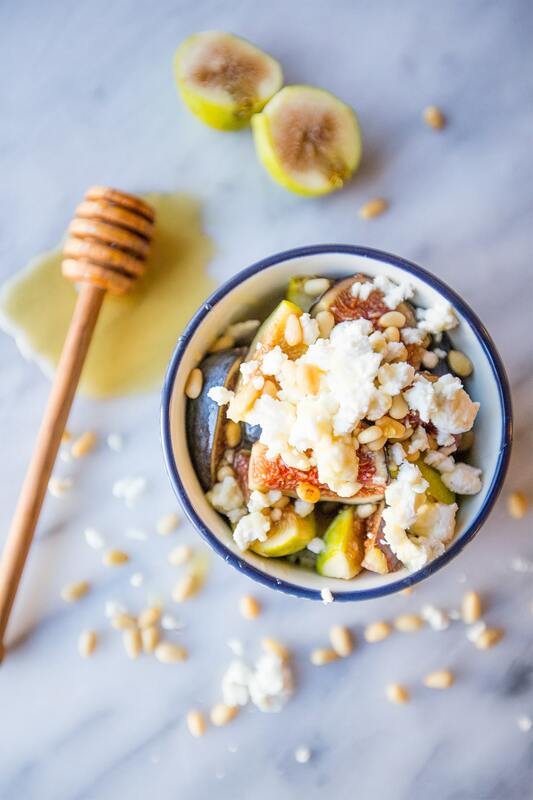 Sweet, salty, and delicious- this fig and honey fruit salad with chevre and pine nuts is a beautiful balance of fresh flavors and perfect for breakfast! While traveling in Eurasia (my husband and I spent a week and a half in the Republic of Georgia and Armenia in the spring), I loved all of the delicious, fresh foods. The only meal I had a bit of a hard time with was breakfast- as we traveled through Eastern Europe we didn’t really find a ton of non-bread breakfast options (hotels had huge buffets, but many cafes in Tbilisi didn’t open until much later in the morning)- though there was always an abundance of fresh fruit, organic honey, and tons of cheese at the large buffets our hotels set out. 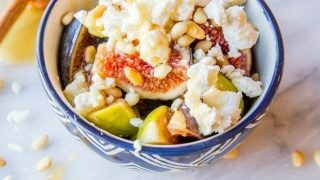 This Fig and Honey Fruit Salad with Chevre and Pine Nuts is a bit of a nod to the impromptu fruit salads I made for myself in Eastern Europe. I have always loved figs, but the amazingly beautiful Turkish and Armenian figs we got to eat were out of this world! I could subsist off just fruit and cheese forever, anyone else? Since this is a very simple recipe, it’s really important to get high quality products. If you don’t have a big jug of raw, unfiltered honey at home- you should! 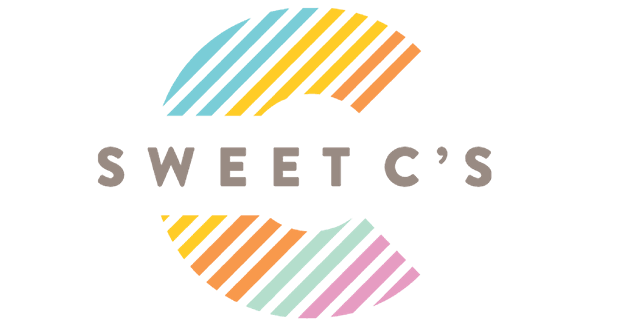 You can find lots of delicious local options at health food stores (here in northern Colorado there are a lot of farms who sell raw honey right off their farm- email me if you’re local and you need help finding some)- high quality honey is really a luxury worth spending on! It can also help reduce allergies if you buy local honey. Make sure you buy ripe, quality figs- as under-ripe figs can taste really, really bland. If you can’t find any dry roasted pine nuts, I just pop them in a pan and heat them on low on a stove for a few minutes to give them a very soft toasted color. It really brings out more flavor to toast pine nuts a bit! This was one of my favorite impromptu meals in the Caucasus region, and if we ever find ourselves back in Armenia, Georgia, or Turkey one day, I know I’ll be making this for breakfast everyday with their amazing figs! If you’re not a huge fan of chevre, or don’t have any on hand, you can easily sub it out for a delicious yoghurt. Pick a good quality yoghurt- I love Noosa’s flavors and LOVE that they are from Colorado- or even a greek yogurt. If you love this fresh fig fruit salad, please check out my other favorite fruit breakfasts – from peach dutch babies to apple chips and almond butter snacks and bananas foster donuts and more! 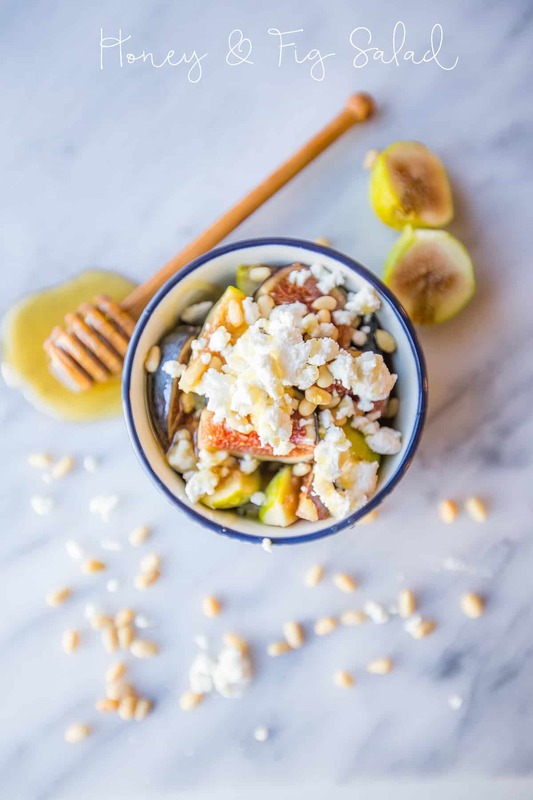 If you love this Fig and Honey Fruit Salad recipe as much as I do, please give it five stars (just click the stars below) and help me share on facebook and pinterest! 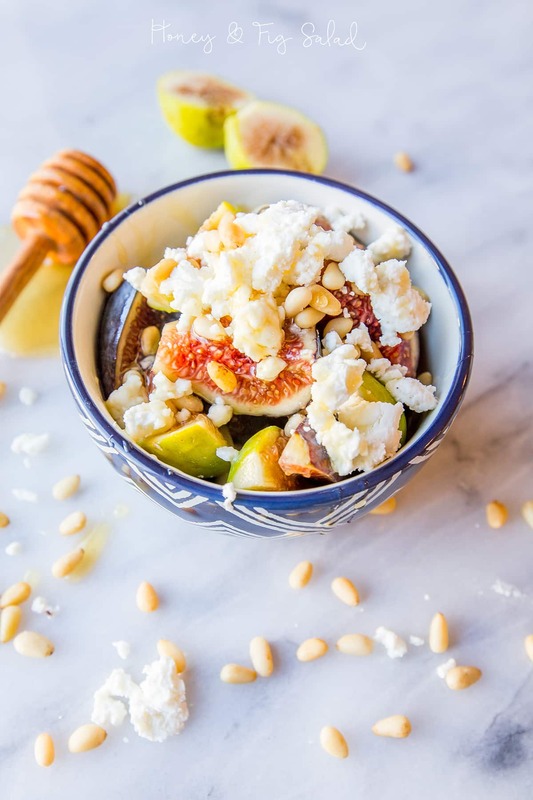 Sweet, salty, and delicious- this fig, chevre, pine nut, and honey fruit salad is a beautiful balance of fresh flavors and perfect for breakfast! Top with pine nuts, drizzle honey on top. I need to find someone with a fig tree – this looks yummy! Your recipe looks amazing. I rarely pick up figs but, this makes me want to. THIS. Wow. This recipe is full of all kinds of deliciousness. I could eat this every day! Figs and local, organic honey are truly gifts from God himself. ohhh looks good and sounds good and even if it is healthy, i would LOVE to eat some! I haven’t thought to add figs or use them in a salad, fruit or otherwise so this will be a fun new taste combo!